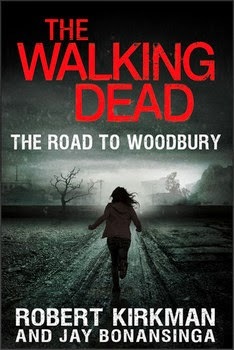 "The Walking Dead: The Road to Woodbury" is the second in a series of novels that take place in the same universe as Kirkman's "The Walking Dead" comic books. The novels serve to flesh out the backstory of people and places from the comic books who never got a chance to shine in Rick Grimes's storyline. The plot of "The Road to Woodbury" follows Lilly Caul, a young woman and self-identified coward at the end of the world. Unsure of herself, suffering from extreme anxiety, and depending heavily on those around her, Lilly makes her way from one not-so-safe haven to another in an attempt to eek out an existence among the walkers. Along the way, something happens to Lilly to make her overcome her fear and discover the heroic survivor within herself. As the title would suggest, Lilly and her companions end up at Woodbury, the fortified town under the leadership of one Philip Blake, aka the Governor. We learned about how the Governor came to be who he is in the first TWD novel, "Rise of the Governor." It's hard not to compare the two novels, and in that comparison the second book doesn't quite rise to the level of the first. "The Road to Woodbury" is missing the shocking conclusion, the nightmare-inducing examination of evil that was "Rise of the Governor." Instead, what it offers is a much more identifiable character study of a realistic survivor. Lilly isn't the stuff of legend like the Governor is. Instead, she manages to represent us—in all our faults and fears—in a surprisingly realistic way (or so we assume, having never actually survived a zombie attack). In "The Road to Woodbury", fans of the TWD comic books will recognize several minor characters who played pivotal roles. The novel fleshes out their backstories and connects them, giving depth to people who remained largely mysteries in the comic books. For comic book readers, the novel is full of easter eggs and surprise connections, making it not only entertaining, but necessarily for filling in the gaps left by the comic books. The ending—while as grisly, intense, and death-defying as any TWD story arc—is perhaps a bit anticlimactic. It's as if the moment the whole book has been leading up to has been delayed at the last second, held over for the next book. This probably means that the third TWD novel (as yet unnamed and unannounced) will likely pick up right where this one leaves off, with the survivors of Woodbury and their tenuous peace under the leadership of the Governor. "The Road to Woodbury" is an essential read for any fan of "The Walking Dead." It does more than simply flesh out the backstory of an important character from the comic books. This book asks the question (better than any other TWD story so far): What would I do? How would I react to the end of the world? Would I rise to the occasion, or cower in fear? What would be my tipping point? What single event would give me the will to survive? And how far would I be willing to go?